Geer Van Velde was the younger brother of Bram, with whom he shared his early life. The two brothers were both apprenticed to a decorating company at The Hague: Kramers. After his military service with the Red Cross, Geer went on a walking tour of Flanders, while painting signs to earn a living. He joined his brother Bram in Paris in 1925 to visit the Arts Décoratifs exhibition. He decided to devote himself to painting and settled permanently in France. In 1926 Bram and Geer lived at Bellevue, where they met the Dutch artist Tjerk Bottema. In October of that year Geer acquired his own studio at number 7 rue Edgar-Quinet in Malakoff. Like his brother, he received financial help from W. Kramers, which enabled him to live and paint. Between 1928 and 1932 Geer and Bram showed at the ‘Artistes Indépendants’. Their future seemed determined by their close relationship. Geer admired his brother, who protected him. Geer, who never broke with realism, was attracted by cubism after the fauvism of his early works. In 1929 he made a short visit to the South of France, and in 1931, penniless, gave up the prospect of having an exhibition and returned to Holland. The following year he was back in Paris with Bram. In 1933 Geer married Elisabeth Jokl, whom he had met at Montparnasse, and the couple moved into an apartment at number 74 rue de la Glacière. In 1937 he met Samuel Beckett, whom he introduced to Bram. The three men became close friends. In 1938 Geer showed 45 paintings in London at the Guggenheim Jeune Gallery. The exhibition was a failure and he retired to Cagnes-sur-Mer, where he lived from 1938 to 1944. This was a period of intense work marked by a desire for unity that was to characterise his entire output. This quest included the theme of the double, which had already been present in the first portraits prefiguring the series Ateliers, in which artist and model dialogue. His figures began to be characterised by a vertical, hieratic appearance: seated female figures are surrounded by objects familiar to the artist, such as a pedestal table, a plant or a hat dummy. He began the series Intérieurs, with a window-picture opening onto the sea through which he explores the question of ‘inside-outside’. The very specific light of the South of France had a decisive influence on Geer’s late work, invading the entire canvas. Geer drew constantly. He was struck by the similarity between his own research and the humanism of Jacques Villon’s ‘impressionist cubism’, in which rigour is combined with poetic gentleness, and by the burst of colour in Bonnard’s work. Beckett saw in his painting an “excessively reticent” approach to the elusive, which signified Geer’s concern for the human condition. Germain Viatte writes in his monograph about the artist, “Geer’s research can only be expressed within the confines of the studio… He has to break the mirror of illusion, recreate its presence and memory, find the vivid quality of the trap that creates us.” Certain gouaches up until the early 1950s are of importance (Musée National d’Art Moderne Paris). Germain Viatte continues: “A surface divided into unequal widths, vertical rhythms that send the gaze from side to side.” He began working with Indian inks, achieving delicate tones. In 1942 Geer Van Velde had a solo exhibition in Nice at the Galerie Muratore. On his return to Paris at the end of 1944 he settled permanently at Cachan, moving into a house that had been built for Tjerk Bottema. He rediscovered the “beautiful tender light” of the Île-de-France region. Through Bonnard, Geer had met Aimé Maeght at Cagnes, and in March 1946 the dealer gave him his first exhibition at his gallery in rue de Téhéran. He showed 40 paintings, including La Méditerranée – a key work with overlapping triangular planes echoing each other, and muted mat shades of colour that nevertheless have a vibrant brightness. Catalogue with a text by Jacques Kober Qualité de l’espace (Coll. Pierre à feu, Maeght, 1946). After the exhibition, Samuel Beckett wrote a study on La peinture des Van Velde, ou le monde et le pantalon (Cahiers d’Art, 1945–1946). In his presentation of Geer’s works he refers to “painting that is extraordinarily calm and gentle”. In June 1948 Beckett wrote another text for Geer’s second exhibition, this time held with Bram: Peintres de l’empêchement, and Jacques Kober wrote Autant parler du silence. (Derrière le miroir, no. 11–12, Galerie Maeght). Geer and Bram showed at the Kootz Gallery in New York through the intermediary of Maeght. Around this time the artist told Bernard Dorival: “The eye does not have all the rights; it must leave something to intuition and intelligence. I tend increasingly towards lyricism” (Les étapes de la peinture française contemporaine, Gallimard, 1946). Geer participated in group exhibitions at the Galerie Maeght: from 1946 to 1947 with Le noir est une couleur (Derrière le miroir no. 1, text by Jacques Kober, with six lithographs by Geer Van Velde), and in 1947 with Sur 4 murs (Derrière le miroir no. 2, texts by Michel Seuphor and René Guilly). We should recall the various journeys that Geer made to Holland in the years following the war, when he was influenced by the rigorous structure characteristic of Dutch landscapes. He was also strongly influenced by the Mondrian retrospective held in Amsterdam in 1946. In November 1952 his last solo exhibition was held at the Galerie Maeght, with a catalogue with texts by Roger Chastel: Devant le miroir, and Frank Elgar’s Geer Van Velde (Derrière le miroir no. 51 with two coloured lithographs). Like it had been for Bram, the event was a commercial failure. Both brothers distanced themselves from the gallery, each from now on following their own solitary path. Never abstract, Geer’s work, with its subtle, sometimes monochrome colours, resembles a long meditation on light. Indescribable movements underline intermediary spaces, the plastic equivalents of which are a linear architecture that gradually gives way to suggest depth. Without ever attaining Mondrian’s radicalism, Geer separates the chromatic surfaces, cut into segments, from the background to liberate “the essential which is not what is visible but our inner world”. Vertical lines surround an empty central area defining the picture space. Gradually these lines disappear, replaced by a square, in its turn divided into four. Planes and colours are distributed from this centre, luminous or dark surfaces underlined by light brush strokes and gouache stains, or by a few lines in charcoal or chalk. Piet Moget, an artist friend, recounted the way in which Geer worked, following his own explanations: “The artist prepared his canvas himself. He needed a plain background, which would absorb… he drew the main rhythms and masses in charcoal, then covered the entire surface of the canvas with a thin coat of zinc white with oil applied very dry without thinner. The charcoal lines remained just visible. He then stuck on newspapers to absorb the oil… He hated a slippery canvas” (Catalogue Rétrospective, Ville de Paris, 1982). Geer remained faithful to this technique. Among the group exhibitions: 1946 Matisse, Marchand, Chastel, Van Velde, Galerie Maeght, Cannes. 1947 Peintres d’aujourd’hui, Galerie Ruhl, Nice. 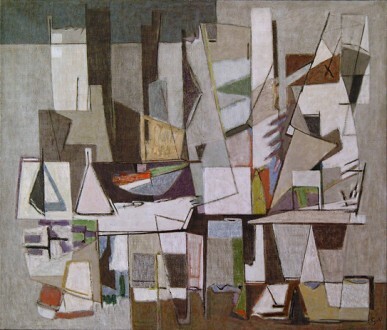 1949 De la figuration à l’abstraction, Museum of Modern Art, São Paulo. 1950 De Manet hasta nuestros dias, Montevideo, Caracas, Lima; Levende Farver, Charlottenborg, Denmark. 1951 first Biennale de Menton, at which he received the first prize for a foreign artist; L’École de Paris 1900–1950, Royal Academy of Arts, London. 1952 Rythmes et couleurs, Musée Lausanne; Drei Künstler ans Paris: Geer Van Velde, Morice Lipsi, Ismaël de la Serna, Recklinghausen, catalogue; Malerei in Paris heute, Kunsthaus, Zurich; Tendances actuelles de l’École de Paris, Kunsthalle, Berne. 1953 Elf tijdgenoten vit Paris, Stedelijk Museum, Amsterdam. 1955 Peintres de l’École de Paris, Varsberg, Sweden, Catalogue. 1958 Nouvelle École de Paris, Kunsthalle, Mannheim. 1959 Malarstwo Francuske od Gauguina dodnia Dzisiejszego, Naradowe Museum, Warsaw. 1961 Pittori d’Oggi Francia-Italia, Turin. 1962 École de Paris, Tate Gallery, London. 1963 Cien Anos de Pintura en Francia, Caracas. He participated annually in the Salon de Mai from 1949 to 1971, as well as selections for Amsterdam in 1961 and Tokyo in 1963. He also took part in the Réalités Nouvelles, and in the Grands et jeunes d’aujourd’hui. He was invited to participate in École de Paris at the Galerie Charpentier in 1954, 1959 and 1960. 1982 Paintings and works on paper. Musée d’Art Moderne de la Ville de Paris. Catalogue, texts by Samuel Beckett, A.M. Hammacher, Piet Moget Ma rencontre avec Geer Van Velde. 1982 Peintures. Galerie Louis Carré et Cie, Paris. Catalogue text by Marcelin Pleynet. 1986 Geer Van Velde. Musée Toulouse-Lautrec, Albi. Catalogue. 1989 Œuvres sur papier. Galerie Louis Carré et Cie, Paris. 1991 Drawings. Collection acquired in 1983 by the state. Musée National d’Art Moderne, Centre Georges Pompidou, Paris. 1991 Rétrospective. Lieu d’Art Contemporain Sigean (Aude) Catalogue, text by Piet Moget. Museums: Paris, National d’Art Moderne and d’Art Moderne de la Ville (important collection). Germain Viatte: Geer Van Velde. Cahiers d’Art, 1989; includes key texts and prefaces.